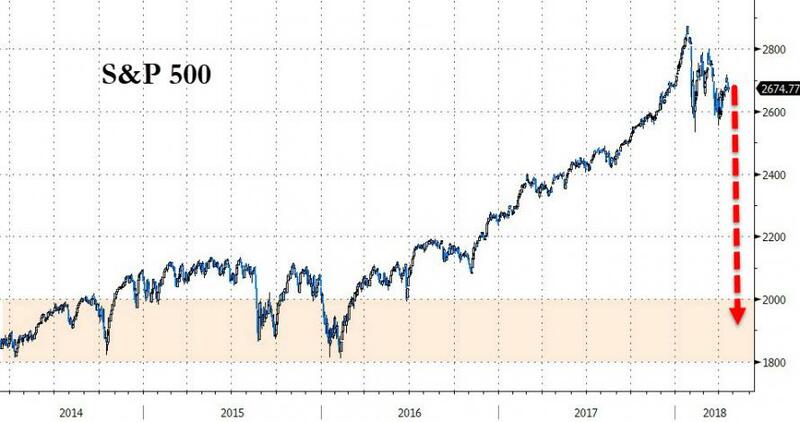 Two weeks ago, 81-year-old investing legend Mark Mobius said he believes that the US market is on the verge of a 30% collapse that would essentially wipe out the gains of the last two years. The renowned fund manager, who left Franklin Templeton after more than 30 years in January, said “all the indicators” point to a large fall in the markets. “I can see a 30% drop,” said Mobius, who launched one of the world’s first emerging market funds. “When consumer confidence is at an all time high, as it is in the US, that is not a good sign. But now, just four months after "retiring," Mobius is coming back as Bloomberg reports he is setting up a new asset management firm to invest in emerging and frontier markets. Mobius Capital Partners LLP has yet to line up outside investors and wants to raise about $1 billion within two to three years. "I wasn’t ready to retire and I was ready for something new after 30 years at Franklin Templeton," Mobius, who has spent more than 40 years working in emerging markets, said on Wednesday. 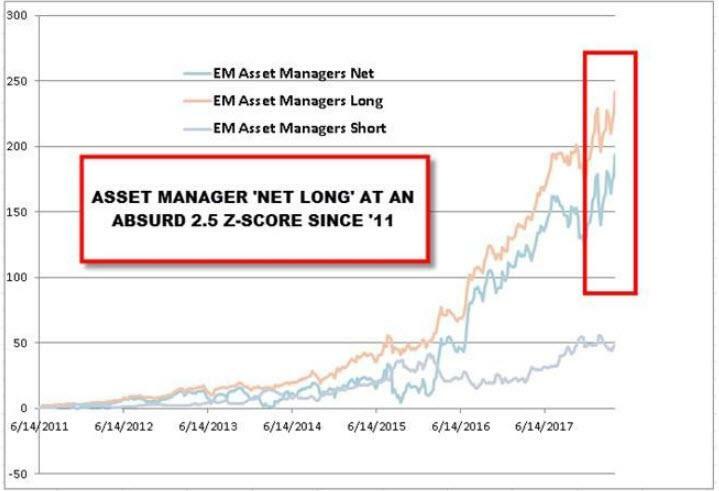 “With all this money going in ETFs and passives, there is a real role for active management where we go into companies and we try to achieve change," he said in a Bloomberg Television interview. Bloomberg reports that foreign-currency bonds of developing nations are seeing bigger losses than during the Asian currency crisis, dot-com bust or the 2008 financial crisis. 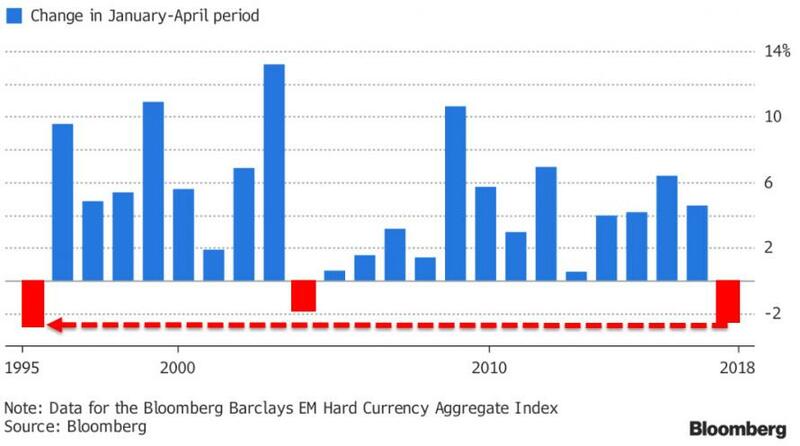 The Bloomberg Barclays gauge for emerging-market dollar debt has slid 2.5 percent since the start of the year, the worst performance in a January-April period since 1995. U.S. Treasury yields around 3 percent are fueling the selloff, underscoring emerging markets’ vulnerability to a stronger dollar. 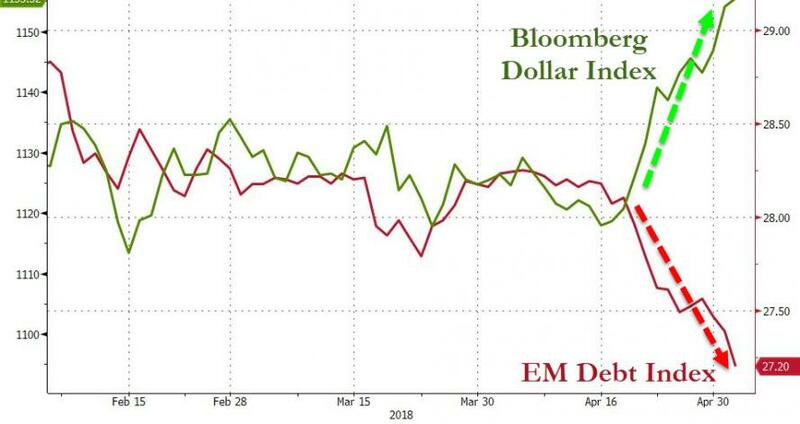 Additionally, Nomura's Charlie McElligott notes that emerging markets equities continue to look perhaps as the area which remains most exposed to a further re-pricing in USD, on account of asymmetric positioning accumulation and (il)liquidity. 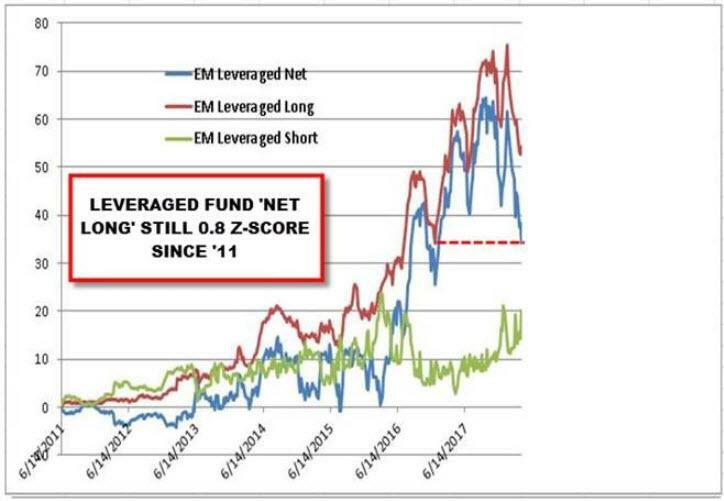 TFF data tells us that despite Asset Managers reducing their longs by $6B last week / Leveraged Funds reducing their longs by $3.9B last week, they remain +$195.5B and $34.6B “long,” respectively. So perhaps it is not surprising that Mobius sees opportunity to pile investor money into these markets after the carnage clears.